February 2, 2019  Trump administration officials are sounding positive that the political crisis in Venezuela will end with democracy. But analysts warn that this political standoff could get much more violent. February 1, 2019  The U.S. has begun the process to formally withdraw from one of its remaining arms control treaties with Russia. Washington accuses Moscow of violating the INF treaty which covers medium range nuclear weapons. February 1, 2019  The Trump administration announced that the U.S. will leave the Intermediate-Range Nuclear Forces Treaty, raising fears of a new arms race. Trump blamed Russia for violating the Cold War-era pact. January 31, 2019  Carlos Vecchio, who doesn't have access to Venezuela's embassy, represents national assembly leader Juan Guaido, who the U.S. and other countries back as they pressure Nicolas Maduro to step aside. January 26, 2019  U.S. diplomats are facing a weekend deadline to leave Venezuela, on orders of the embattled president. Meanwhile, the U.S. is trying to rally international support around their preferred leader. January 24, 2019  The State Department says Venezuelan President Nicolás Maduro can't expel U.S. diplomats since it no longer recognizes him as the nation's leader. But where does that leave the U.S. personnel? 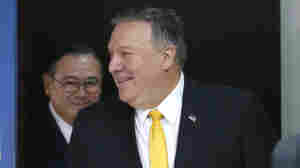 January 18, 2019  The U.S. and North Korea are working out the details for a possible second summit between President Trump and Kim Jong Un.